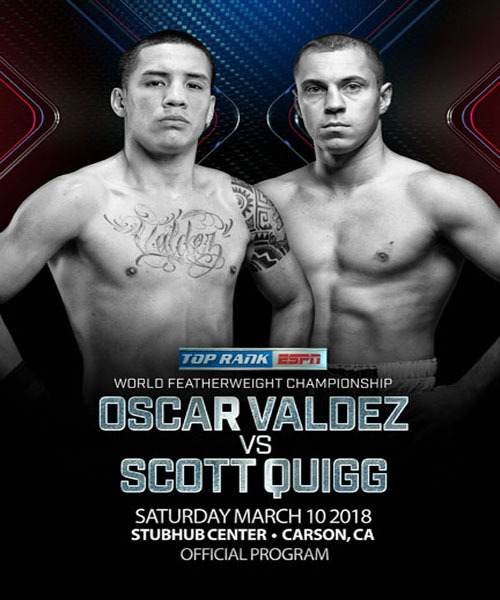 Undefeated WBO featherweight world champion Oscar Valdez begins the third year of his championship reign by defending his title against former WBA super bantamweight world champion and current No. 2 world-rated featherweight contender Scott Quigg. For Valdez (23-0, 19 KOs), of Nogales, Mexico, this will be his fourth title defense since winning it in 2016. Quigg (34-1-2, 25 KOs), of Bury, Lancashire, England, will be making his U.S. debut, with Hall of Fame trainer Freddie Roach in his corner.